Let's be honest, there's not a whole lot going on in the ice cream world right now. Besides the fine folks of Gelato Fiasco cranking out a ton of new stuff, the next month or two is probably going to be pretty devoid of any new product releases. 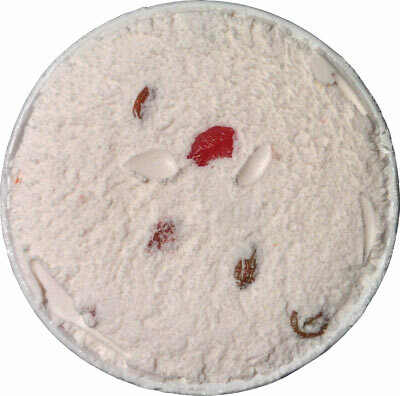 So what's an ice cream fan to do during these chilly months? Well, wait for crazy products to go on sale ofcourse! Now I've seen this one for the last few years and I've always been tempted to grab it if only for the fact that the bright red container sticks out so much amongst its peers. I then proceed to read the description every year and quickly change my mind when I realize that it's probably just some unpleasant rum raisin knockoff, or worse yet, some kind of strange fruitcake flavored ice cream.... but I'm trying to be mature and more open minded these days.... plus it's on sale for $2.99 and I'm starved. I'll admit it, I pulled off the lid and scraped it cleaned with my spoon, took a bite... and I was afraid. Is that a rum burn I taste? Oh man, what have I done? But I haven't spent six and a half years blogging just to turn back now. I take a bite, and then another, and then another still, and I actually start to like it. The base is sweet but mild, creamy but not too dense, and that's enough to keep me going. I get more adventurous and start going after the fruit. The raisins, well, I'm still figuring those out, but the cherries? Yeah, for the first time in a very long time (maybe ever), they are just cherries. No tart, no bite, just plain red cherries with a bit of sweet cherry flavor to them. I've finally found my kind of cherry, aka the non-offensive kind. They're actually fun to eat because it's about the texture change from the base rather than some kind of biting flavor blast. Cool. I can dig this. Does that mean this is some plain, ho-hum flavor? No, that's not what I mean. There is a lingering complexity to every bite. For me, it's not about fancy, it's about this surprisingly pleasant balance of sweet and creamy yet different from some hum drum vanilla flavor. There's no really burn or bite, it really does just want to be a pleasant holiday flavor. Wait, I need to add a disclaimer. It's a few hours later and I still have a lingering rum raisin aftertaste messing with my afternoon. It's not terrible, but I'm not a fan either. --- a few more hours, and I have to say, I'm a little afraid again. It went well, but I worry it was a fluke. I know, it's silly, but part of me things I still taste the rum kick. 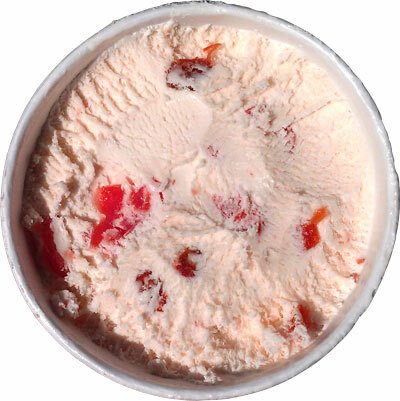 On Second Scoop: I thought I had updated this post, but basically I threw this flavor out. I could never get in the mood for it again. I may have tried a few more bites, I may not have. Sorry for not following through. How about the new Peanut Butter Fudge Sundae Ben & Jerry's??? ha! I'm getting there, several stores still trying to ditch there cotton candy supply. 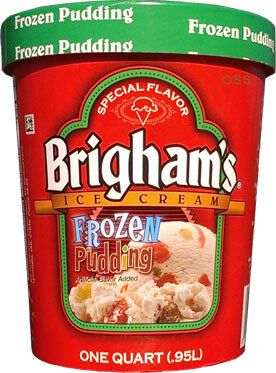 Cannot find Brighams Frozen Pudding ice cream anywhere. It is usually in the stores at Christmas time, but not this year. Is there anywhere that I can purchase it??? It takes a real man to enjoy Frozen Pudding ice cream. You, simply, are not up to the task! That should have been your review in a nutshell. I encourage you to say the edited out part to my face. No need to be a jerk about your opinion.